Wow! This piece is absolutely breathtaking! If you're looking for a special display for the winter season or maybe a very special gift, you've found it! You will wish it was winter all year long! Snow was made from heavily stained and painted cotton batting. All of the letters are stuffed to give it substance and dimension. The letters were then handsewn to each other and to the snowman, making it one piece and able to stand all on its own. Now, the "O" is also Mr. Snowman's chubby little body. His head was made separately and then attached. His eyes and mouth were made from black painted stones. His nose is a real stick. His hair is moss. He wears a red and green plaid homespun scarf. I gave him rusty jingle bell buttons secured with rusty safety pins, and then I tucked in some green sprigs for added color. He also wears a black painted muslin hat that has been secured to his head. Then came the fun part - decorating the display! 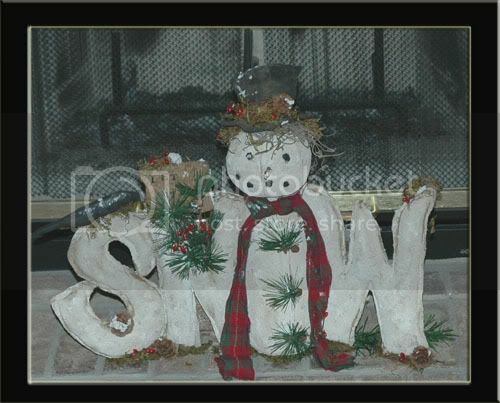 I gave Mr. Snowman a friend, an old black crow, and secured him to the top of the "S" with some reindeer moss. I added reindeer moss, pinecones, and red pip berries to the bottom of the letters, to the top of "W", the sign, and Mr. Snowman's hat. I made a sign out of stained cardboard and a real stick. It reads, Let it Snow! I tucked it into the "N" with some sprigs of green and red pip berries. As the finishing touch, I added snow here and there and everywhere. It is NOT quite as white as it shows up in the pictures. The entire piece is heavily stained to give it a very old and worn look. This is definitely a piece you will cherish for years and years to come! It will take your breath away! Snow is 18" long and 14" high. It will stand on its own without being propped. It will arrive signed and dated. Pictures just cannot do this awesome piece justice!